I thought I'd share these fun pencil-shaving lions with you this morning. My very talented friend Hazel Terry sent them to me for my birthday, aren't they sweet? I'm a Leo you see. Hands up those who are old enough to remember Parsley? That's a really cute lion! I am be old enough for Parsley but I don't think it aired in the Netherlands, too bad! 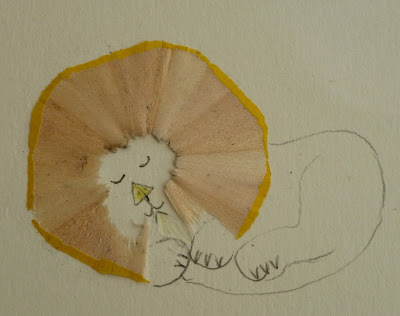 Great lion pencil shaving pictures. I loved Parsley too... one of my most treasured possessions was a Parsley soap- wonderful to see that clip. très joli! une excellente idée! Those lions are great... I just love the way Hazel looks at the world!! what a clever lady ! the lions are so sweet and such a clever idea. oeioei the pencil lions are adorable!! Oh! Que c'est beau, que c'est beau!! !